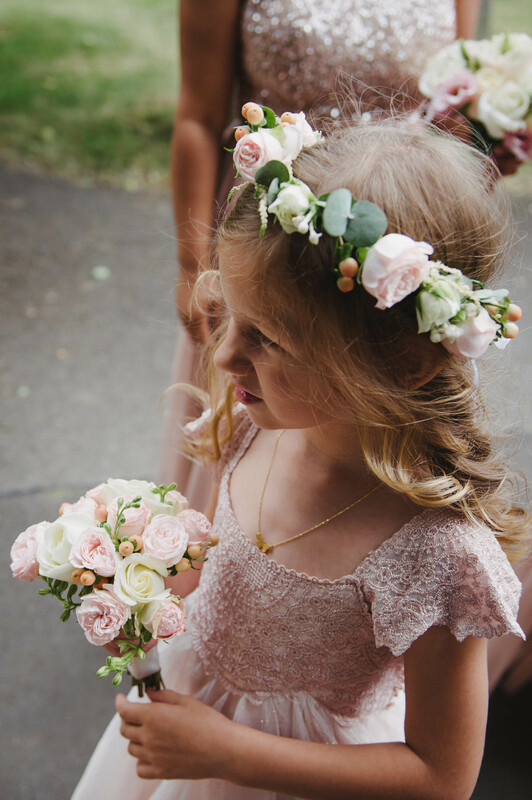 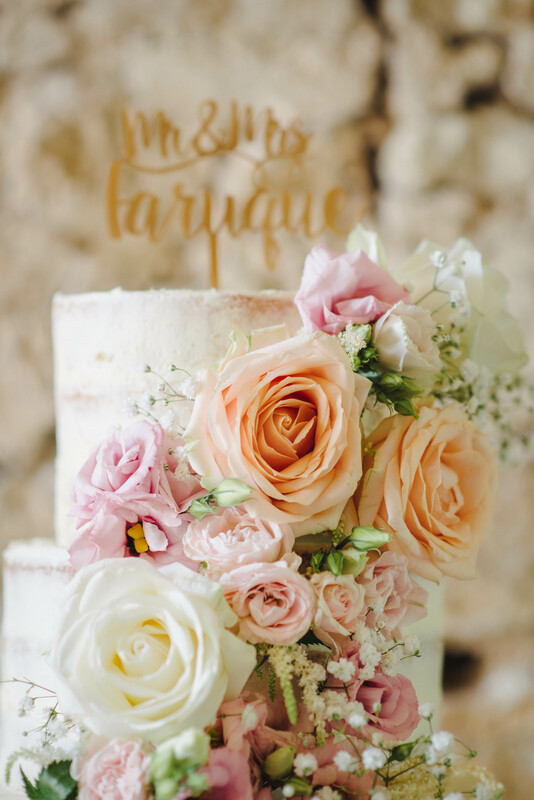 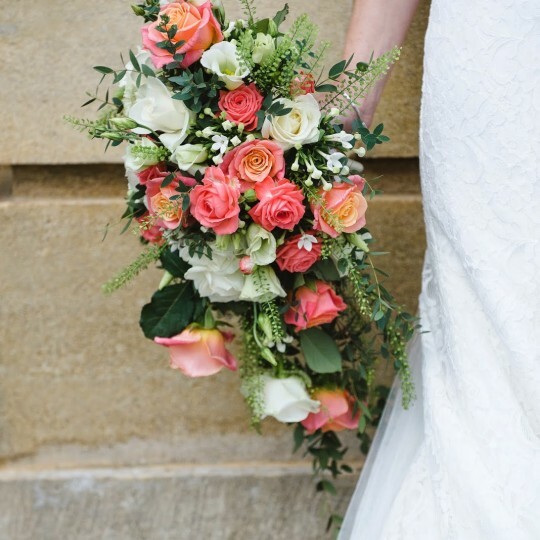 Jess and Omar's beautiful peachy pink wedding at Notley Abbey - Joanna Carter Wedding Flowers | Oxford, Oxfordshire, Berkshire, Buckinghamshire and London. 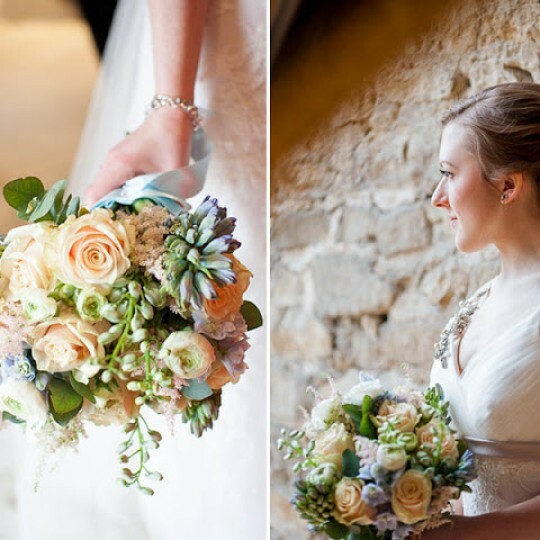 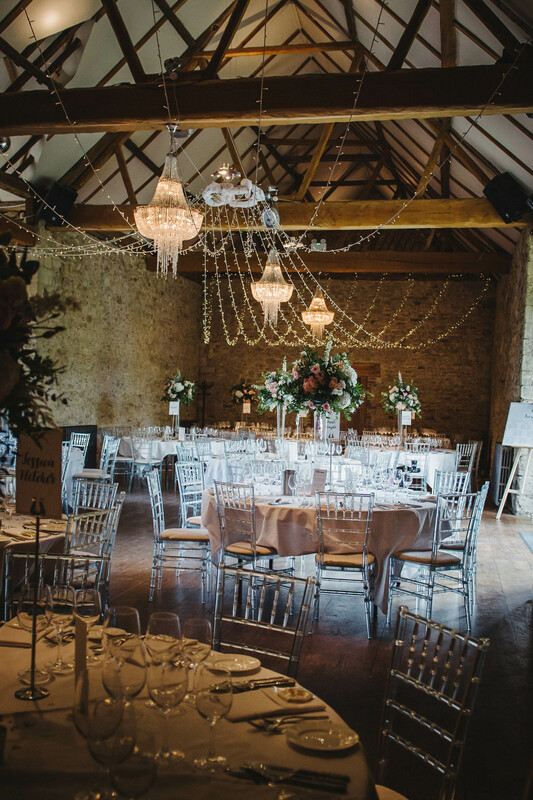 Notley Abbey is a stunning wedding venue with a wonderfully romantic history. 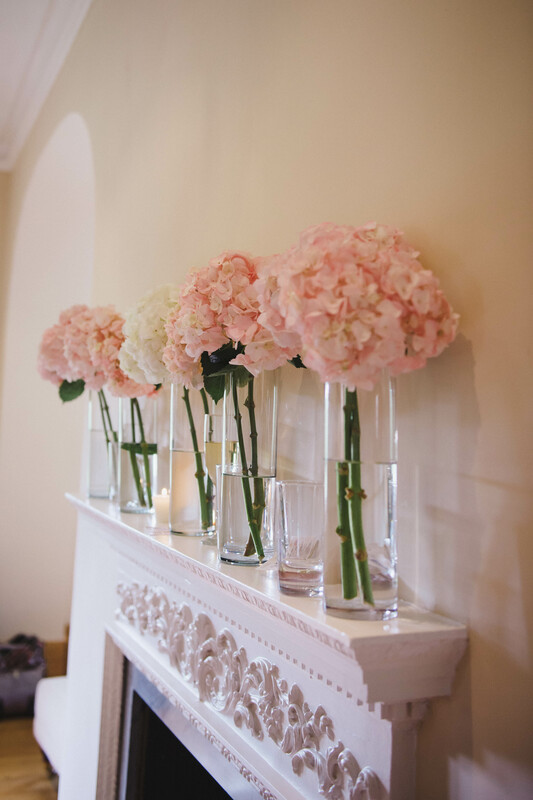 It was the former home of Laurence Olivier and Vivien Leigh and was visited on several occasions by Marilyn Monroe. 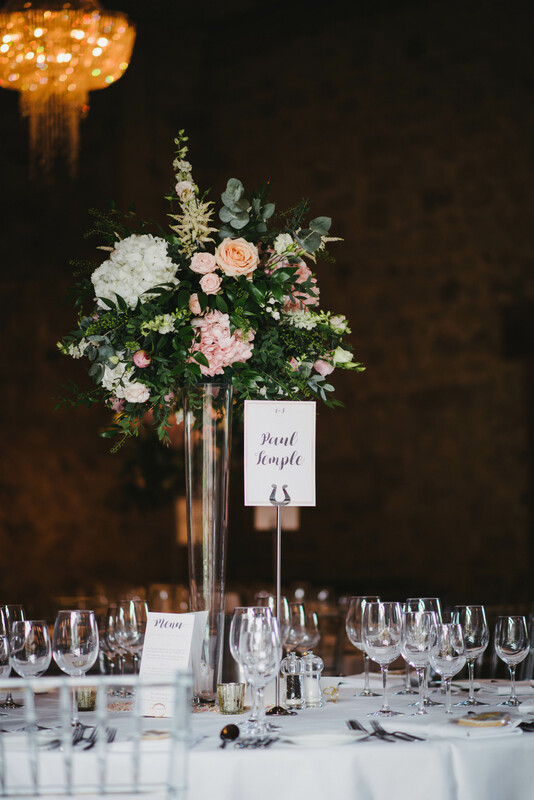 The venue is a stunning mix of original features like high ceilings, fireplaces and the stunning refectory all decorated in a clean modern style that makes it a florists dream to decorate! 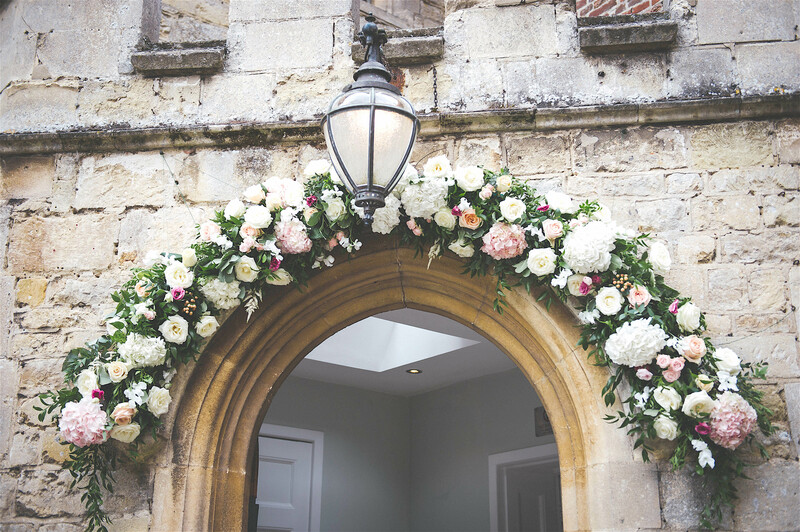 Jess and Omar held their wedding in a stunning local church, St Mary’s in Thame and then moved on to Notley Abbey for their reception. 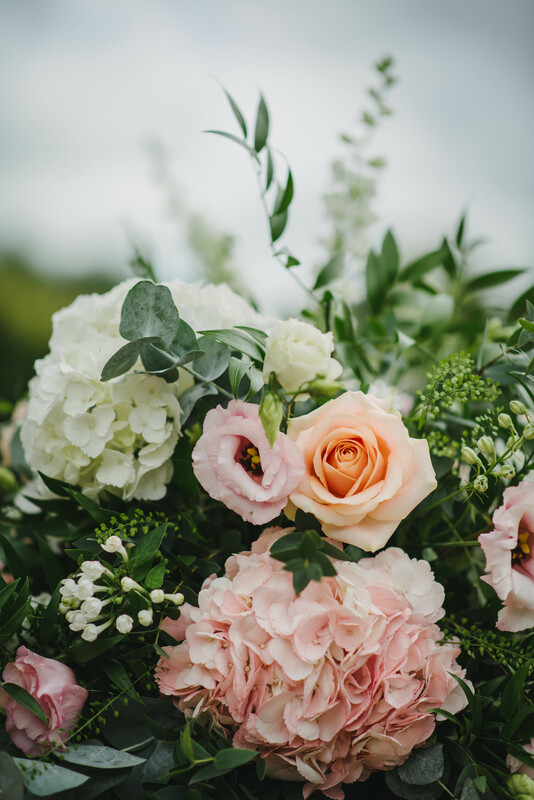 Jess chose a palette of blush pink, peach and ivory for her wedding flowers and added lots of stunning summery eucalyptus foliage to the mix. 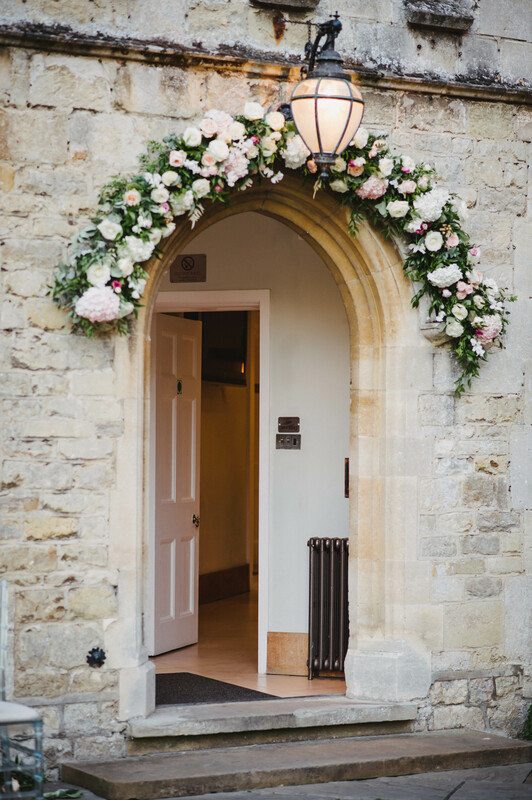 The entrance to Notley Abbey is the perfect spot for a gorgeous flower arch to welcome guests so we began all our lovely arrangements there! 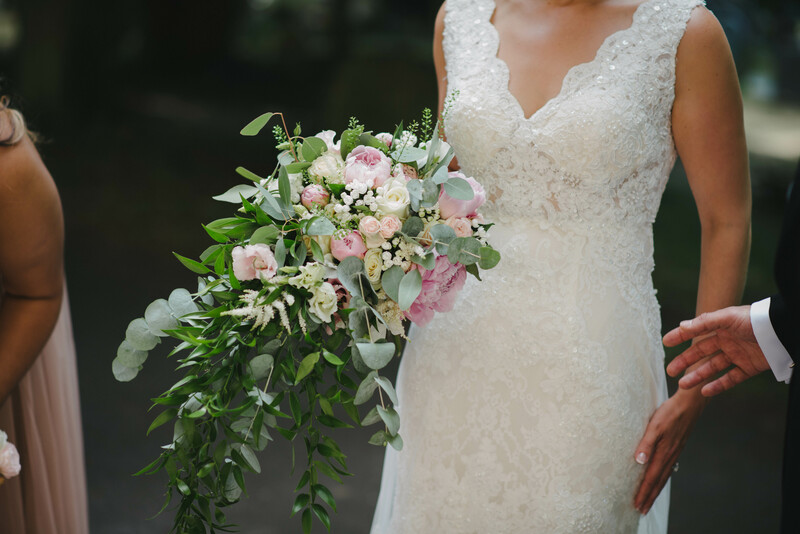 Jess chose a loose trailing bouquet of peonies, roses, spray roses, lisianthus, astilbe and bouvardia with thlaspi, eucalyptus and for her bridal bouquet. 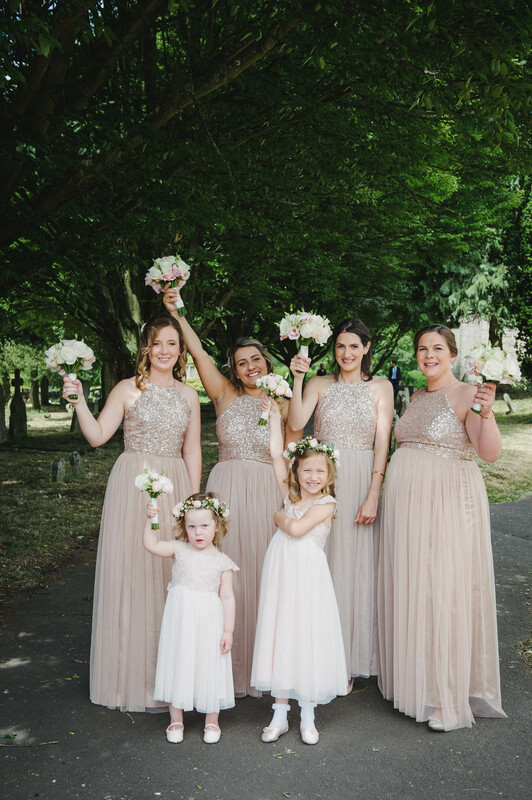 The bridesmaids wore lovely sequin topped dresses and carried smaller hand tied versions of Jess’s flowers. 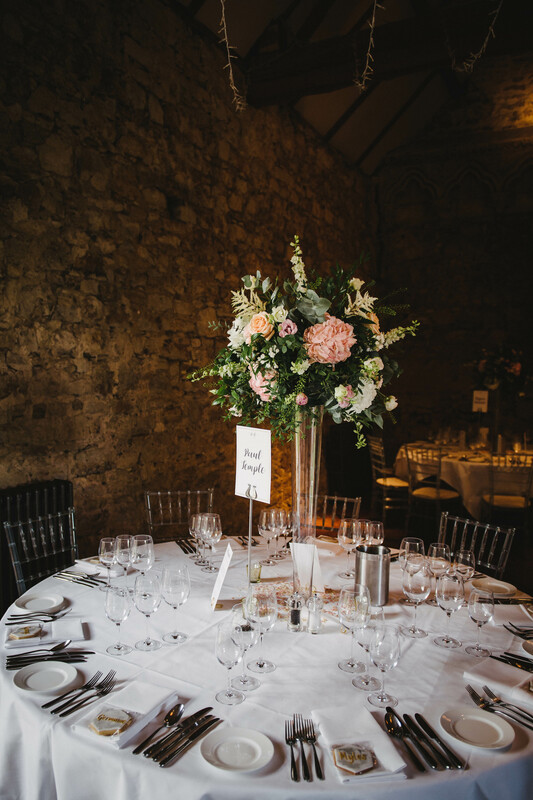 In the lovely refectory we placed tall slim glass vases topped with a loose ball of flowers. 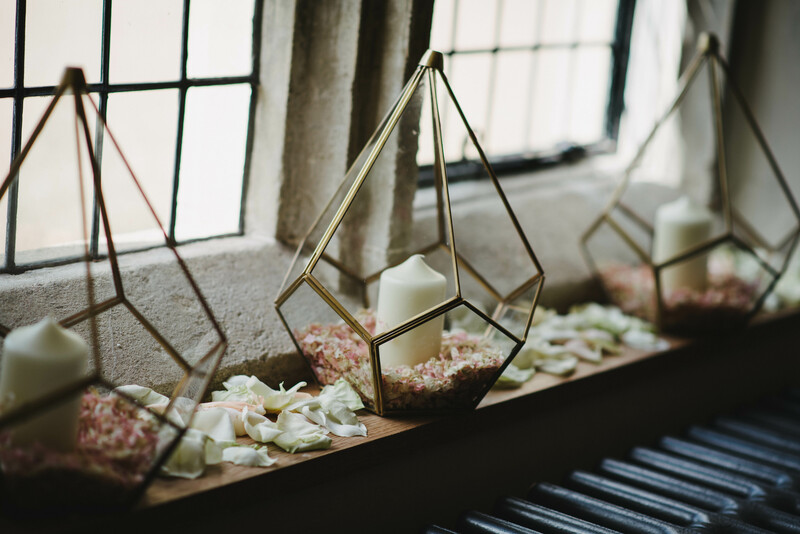 We added petals to Jess’s lovely copper and glass lanterns which were used to decorate the windowsills in the main house and placed simple effective tall vases of hydrangeas on the mantelpieces. 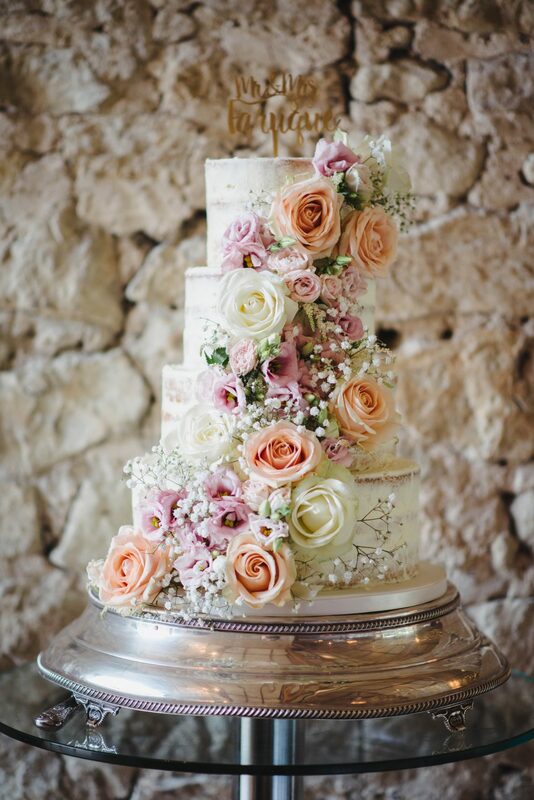 One of my favourite bits from the whole day was the cake which Jess asked us to decorate with a sweeping garland. 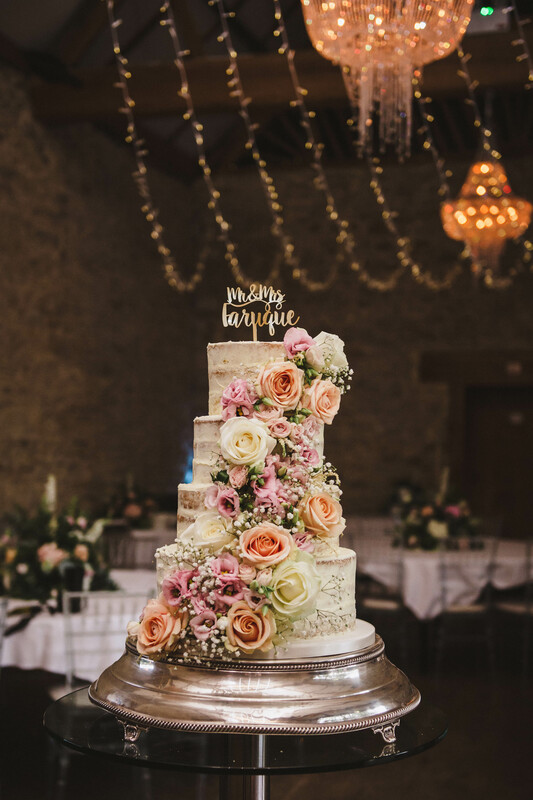 It was a real showstopper! 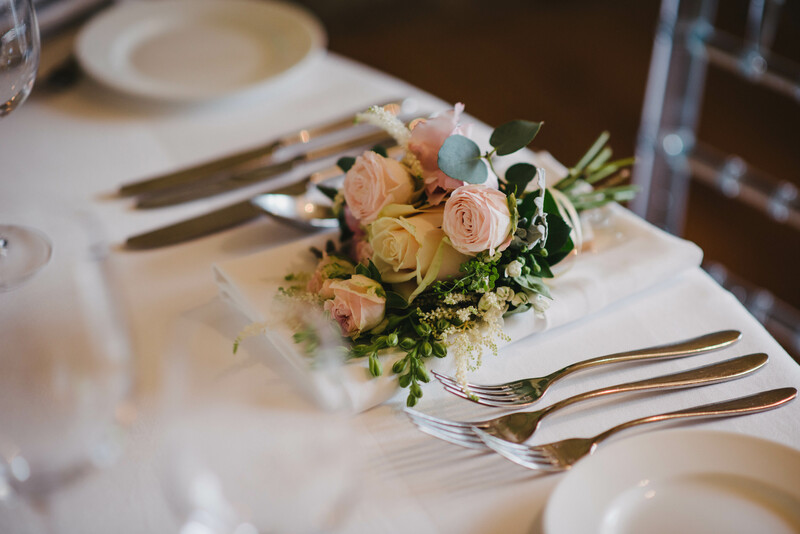 Our final touch was to add a small cluster of flowers to Jess and Omar’s place settings. 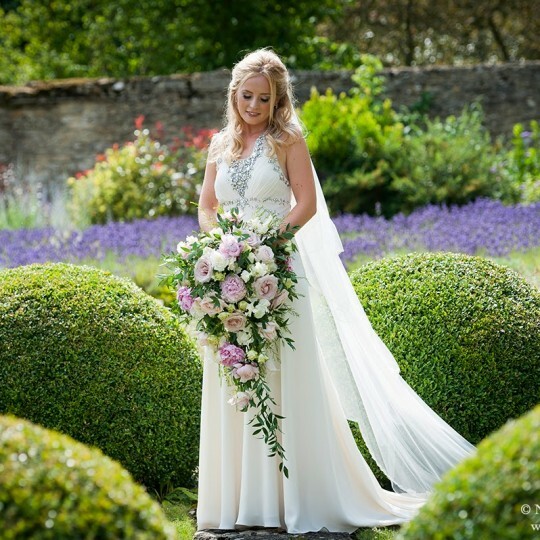 Thank you Jess and Omar for letting us be part of your lovely day at such a stunning venue.